Glamorgan 180-5 beat Sussex Sharks 178-7 (20 ovs) by five wickets. Chris Cooke smashed an unbeaten 65 on his 28th birthday to lead Glamorgan to a nail-biting five-wicket home victory over Sussex Sharks. England's Matt Prior struck 39 off 24 balls and was well supported by Ed Joyce (39) as Sussex totalled 178-7. Jacques Rudolph's 50 looked in vain for the hosts, as Steffan Piolet took 2-33. But Cooke had other ideas, powering 11 fours and a six from 31 balls, allowing debutant Darren Sammy (nine not out) to seal victory from the game's last ball. 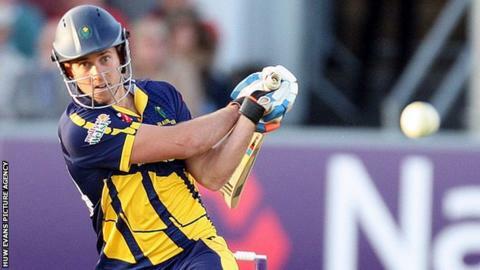 Glamorgan have won the toss in all five T20 meetings with Sussex. Earlier, Sussex reached 79-1 from their first 10 overs after being put in to bat, thanks to a 67-run stand for the second wicket between senior players Prior and Joyce. Both men fell in the same over from Jim Allenby (2-31), but Ben Brown scored at a rate of two runs per ball for his 26 to keep the momentum going in tandem with Rory Hamilton-Brown, who made 27 from 20 balls. Even though Graham Wagg (2-28) returned to oust the pair in successive balls, Sussex's total looked more than competitive on a slow pitch. Glamorgan's reply did not start particularly quickly and when they were reduced to 76-3 in the 11th over, victory looked out of reach. South African opener Rudolph kept the home side in the game with five fours, even though they were slipping behind the required run rate, but it allowed Cooke to step forward and take charge, upping his scoring rate with a flurry of boundaries and wresting the initiative away from Sussex. Ben Wright (15) came in to launch two important sixes before West Indian import Sammy joined Cooke to help Glamorgan score the 13 they needed from the last 10 balls.